Fitness Manager PLUS DAC is Fitness Manager version which support Door access control. It works with door access systems from popular brand ZKTeco. We are not sellers of door access control devices. If you want to purchase door access devices you should contact your local stores which sell products from ZKTeco or contact them online. First connect your PC on which Fitness Manager is installed to Door access control system using network or serial cable. 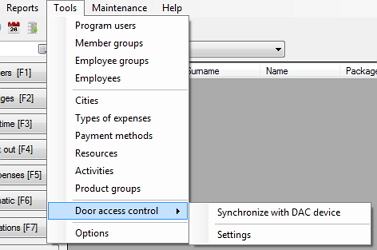 To set Fitness Manager to work with DAC go to Tools -> Door access control -> Settings. There you can set parameters for connecting to Door access control system and test connection. You can also enable/disable using door access system in Fitness Manager. We have added this feature so you can turn it off in case of door access device malfunction. Before adding new package to the member you need to add RFID card numbers to the member. Keep in mind that this will not add member to DAC device. Only when you add new package to the member, FM will upload member's data to DAC device and grant him access to the gym. Every day when you start Fitness Manager, it will check the list of members with expired packages. Fitness Manager will delete/disable all members that have no other active packages from DAC device to disable access to the gym. When a member swipes the card on access control device, member’s visit will be saved in FM database so you can track it later through various reports. This feature is added in FM version 9.6.0. Check-out is optional. If your members do not check-out using RFID cards, FM will make automatic checkout with default time of 23:00. If you add a package to the member by mistake you can delete it. When you delete it program will check if member has any other active package. If not, his access will be disabled. If you wish, you can enable access to the member which package expired by changing the End date and providing the reason for this change. If for some reason uploading or deleting member to DAC fails (DAC device turned off, cable unplugged or RFID number is empty), those changes will be saved in program but they will not be synchronized with DAC. After fixing the problem you can go to Door access control->Sinchronization and choose Upload unsynchronized or Delete unsynchronized to synchronize data with DAC. There is also an option Upload members with active packages. This option uploads all members with active packages to DAC.